Keiji Haino and Peter Brötzmann. Performance view. Photo: Geoffrey Smith II. PETER BRÖTZMANN AND KEIJI HAINO are free improvisation elders who, as a duo, have developed a sonic theater of destruction. While composers use pitch, melody, and rhythm to establish themes and develop them, these improvisers use those tools to work in counter-intuitive ways to instigate instability and flux. Their recent show at the Chapel was SRO. While many Bay Area residents are mourning the gentrification of our cultural landscape, I honestly can’t remember a time when three hundred people gathered on Valencia Street to hear free jazz. Keiji Haino. Performance view. Photo: Geoffrey Smith II. While Brötzmann was distancing himself from Germany’s new social order, the Japanese establishment was distancing itself from Haino, who found himself banned from NHK (one of Japan’s largest public broadcasters) for forty years, after many listeners complained when a DJ played his music. A multi-instrumentalist who jumps genres effortlessly, in his impressive discography he shows an interest in psychedelia, noise, experimental rock, and Ma, the Japanese concept of negative space, which translates to silence in music. Brötzmann prefers short phrases and enjoys selecting three or four notes to organize in patterns. He develops the material by re-ordering the pitch sets in unpredictable ways. These shifting tone sequences become hypnotic and are emblematic of Haino’s conception of accompaniment: Guitarists strum to establish harmony and pulse. While Haino may use common tones to tether harmonic threads to Brötzmann, his strumming is more akin to erratic stabs. He can establish motion, a primal element of rhythm, without implying a recognizable pulse or meter. Both players arrived at free improvisation by way of non-musical traditions. Brötzmann spent his early years as a visual artist associated with Fluxus. This relationship inspired a life-long practice of experimentation with forms, reconceptualizing the role of basic elements, and a passion for collaboration with musicians outside the sphere of free jazz. Haino’s point of origin was aligned with Antonin Artaud’s Theater of Cruelty, where rejection of form in favor of chaos was a governing principle. The element of cruelty, Artaud felt, was the shock value experienced by the audience when confronted with raw emotion or disarray—a tradition that seems to lay the groundwork for the duo’s performance. Peter Brötzmann. Performance view. Photo: Geoffrey Smith II. The concert opened and closed with an atmosphere of ritual. Brötzmann played the tárogató in these passages, a Hungarian instrument similar to the clarinet. 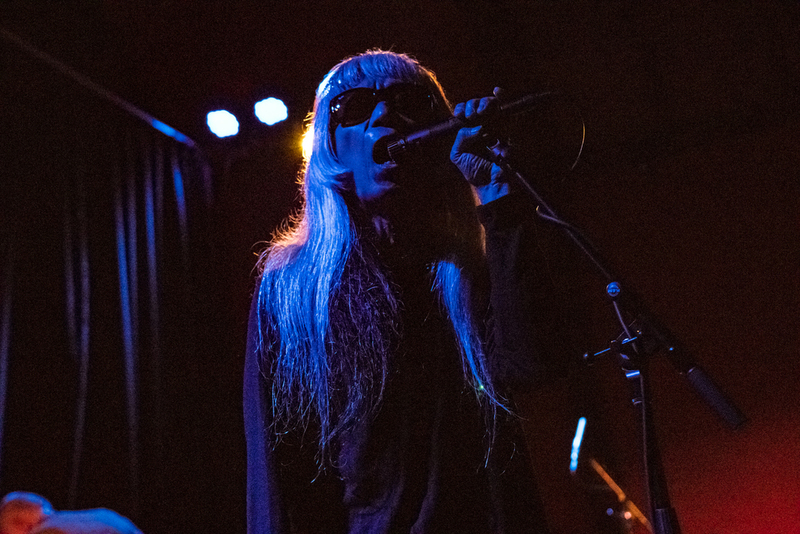 Haino used his voice, which has a range of over four octaves and can switch from a light tone color to a growl from the emotive depths of Noh theater as he transforms his identity through diverse sonic and physical gestures, shapeshifting between genders. Brötzmann accompanied with spinning ostinatos, a pulsating backdrop for dramatic incantations. Haino switched to parade cymbals, then drum set, mirroring his approach on guitar. Gestures forged an impression of a drummer poised to launch into a groove, yet he resisted the illusion of security associated with coherent beats. 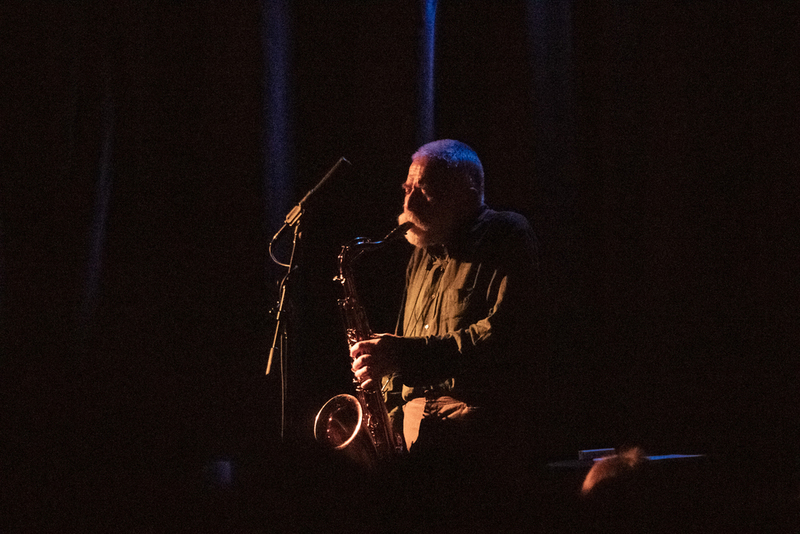 In the middle of the concert, Brötzmann switched back and forth from tenor saxophone to Bb clarinet while Haino worked his amplified guitar with irregular looping effects. They abandoned the sense of order that the opening ritualistic section had established, allowing the music to reach its most aggravated and frenzied conclusions. Both players swapped foreground and background roles throughout, establishing independent leadership, and forging different pathways to concise destinations. The audience wildly approved. At first listen, this boisterous pairing of reeds and guitar felt brutal and elemental, not unlike a shouting match. A closer focus on interplay revealed a music rooted in the call and response tradition, but transcending it with carefully orchestrated layers of sound. Brötzmann rarely played in the same range as Haino, and both players proliferated their grammar with microtonality, where pitch is a fluid and expressive element. At times Haino buried Brötzmann with volume and intensity, and the saxophone was consumed in the overall texture. Eliminating your opponent with dense patterns plays as an act of demolition. It’s common for these musicians to be labelled muscular (and other testosterone-laden terms), but it is perhaps more fitting to register them with the female archetype Kali, who enacts destruction in order to make way for new life. 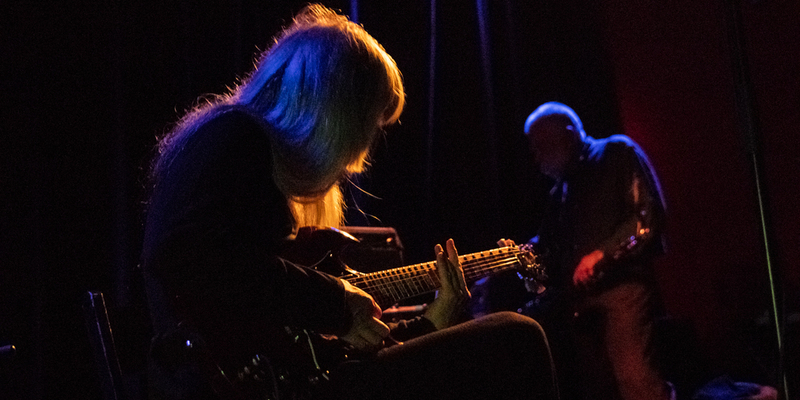 As we embark on a new century amidst socio-political upheaval, the Brötzmann/Haino duo feels like an artistic expression of the moment we are living in and experiencing every day. 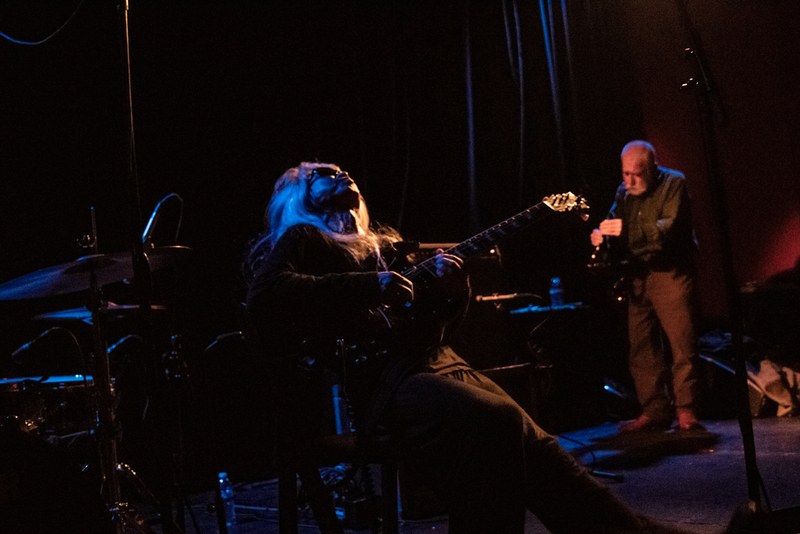 Peter Brötzmann / Keiji Haino Duo performed at The Chapel in San Francisco, California on August 8th.